Professional Outdoor Medical Educators (POME) is a not-for-profit, consensus-driven professional wilderness medical educator group actively involved in developing guidelines in wilderness medical programs which will allow educational providers to meet the highest standards possible. This continuing effort also includes cooperation among schools with a proven record of longevity and activity in the field and commitment to strive for better educational opportunities for students. Part of POME's mission is to provide assistance to students in locating classes and ensuring that there are consistent requirements for recertification from each of the member schools. This professional Guild is composed of five schools whose directors are the majority of the members of the Wilderness Medical Educators Collaboration (WMEC) that have created the nationally published, peer reviewed WFA-SOP, WFR-SOP and have done significant work on a WAFA-SOP standard. Three of them were working in wilderness medicine education improvement before WMEC's WFA SOP project which stared at a Snowmass WMS meeting in 2009. 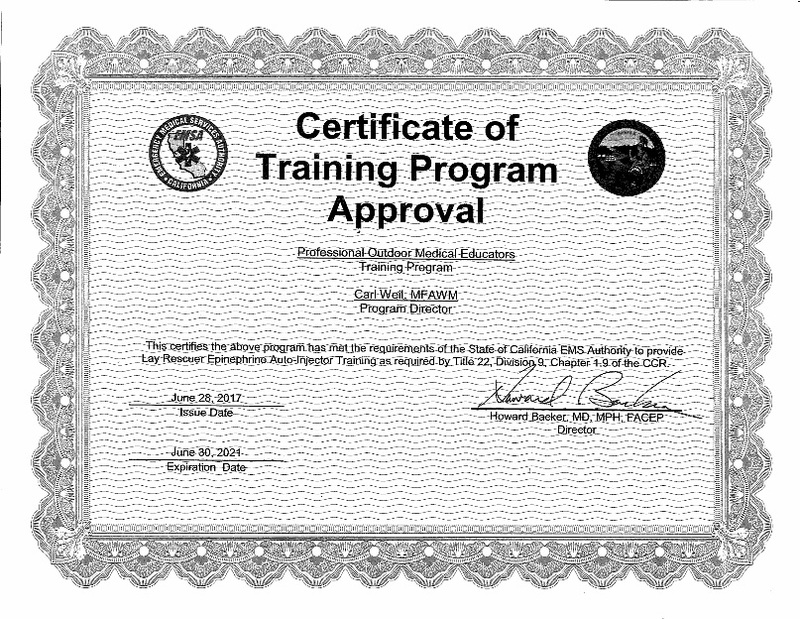 POME's first large project was to make offering and obtaining a California Epinephrine delivery certificate easy and affordable to Wilderness Medicine students of the five member schools. All five schools exceed the original quality guidelines for recommended Wilderness Medicine Schools developed and publicly presented at a WMS meeting in Colorado in 1997 when POME was founded.